Here is A Look At An Album You Should Own! Beat Rabbi And Deepspace 5 - "Deepspace5oul"
Beat Rabbi decides to fly solo this time around.Although "Deepspace5oul" releases in 2008, it has been in the making since 2003. 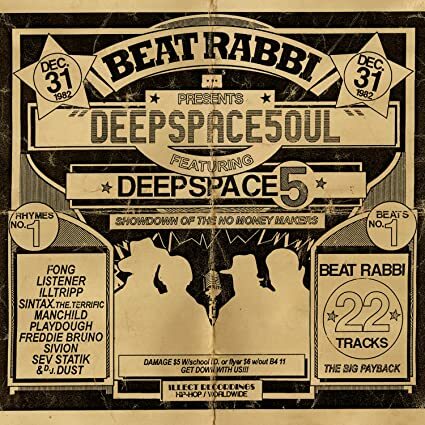 As Beat Rabbi envisioned an album paying homage to classic hip hop, funk, and jazz, the DS5 crew laid down the lyrics, after the fact, ending up with the finished product of "Deepspace5oul." A twenty-two track collective effort that features all Deepspace 5 emcees including Manchild, Playdough, Sivion, Listener, and newcomer Illtrip, "Deepspace5oul" is exemplary of the talent that can arise when forces come together. In 2000, Beat Rabbi had his major break in production as he was contacted by Manchild of DS5 and invited him to become a part of the DS5 crew. Immediately, Beat Rabbi was asked to help produce DS5's debut album, "The Night We Called It A Day" and produced the popular track "Stick This in Your Ear." Along with producing DS5 tracks, Beat Rabbi also worked with the group "Circumcised Minds" and produced their full-length album "The Real Battle." Beat Rabbi and DS5 take on the challenge to prove their message as it remains strong in tracks such as "Beautiful." With its slow, ominous horn intro, the hard beat and bass eventually releases as some talented scratching is incorporated. Playdough and Sivion of DS5 play up this track with their lyricism while showing how life is more beautiful than what it seems as they say, "His strength and my weakness are beautiful." A deep instrumental bass and echoing twang reverberate throughout "Side Note" while showing that "on a side note, never know with these journeys that we take." "Four words, "dance your life away"
Three words, "throwing life away"
Remember that beauty is only skin deep..."
But you have to decide who's lying"
Many can argue that the type of beats and lyricism coming from Beat Rabbi and DS5 are a bit outdated for the present hip hop scene as it reflects a sound that was more popular in past years. On the contrary, Beat Rabbi's 70's funk, jazz inspired sound is timeless and irreplaceable in the timeline of hip hop. It is exactly the type of beat that I seem to be drawn to over and over again as it never gets old. It's the sound that many have made popular including that of famed labels such as Quannum. Unlike what the hype says, this type of hip hop is far from dying and yes, it's not the krunked, club hits you hear on the radio, but this is what makes it underground. "Deepspace5oul" is a celebrated collaboration between Beat Rabbi and DS5 that only emphasizes the capabilities of one another. An unexpected surprise of classic sounds and variety of lyricism is sure to engage any true underground hip hop fan.